The Mantis tiller is an incredible lightweight cultivator that has made gardening easier for millions of satisfied owners. Originally designed for landscapers, Mantis tillers have become a favourite with home gardeners all over the world. 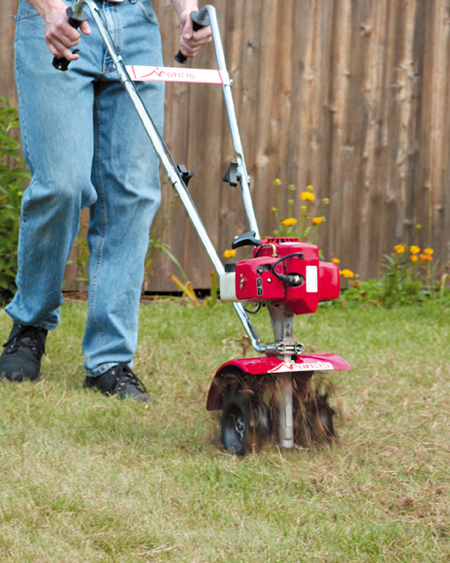 This is a practical attachment for Mantis tillers allowing the tiller to be used to aerate lawns. The aerator cuts thousands of tiny slits in the turf, encouraging beneficial micro-organisms in the soil and allowing air, nutrients and water to penetrate the surface and give a healthy, green lawn. The Manits aerator attachment is also ideal for use when spot seeding to repair damaged areas of lawns. This item can be supplied carriage free to UK mainland addresses. Randells are Mantis appointed main dealers for Norfolk. We have a full range of Mantis tillers and accessories in stock at our Horstead, Norwich and Toftwood, Dereham branches. We provide full warranty, service and parts support for all Mantis garden equipment. Already own a Mantis machine and need service, parts or an accessory? Please contact us by email horstead@randells.net or dereham@randells.net or telephone 01603 738635 or 01362 699888.